It's been a busy month for items of local interest on the national auction circuit, with the nun-owned Honus Wagner card and more recently the lockers of Mario Lemieux and Sidney Crosby from the Igloo. But this latest offering isn't too shabby, either. Harvey Haddix, he of the perfect game taken into the 13th inning in 1959, was quite a collector of memorabilia during his playing days on the MLB level. That's great news for the Haddix family, which will reap the benefits of a few items from Harvey's collection via the auction circuit. 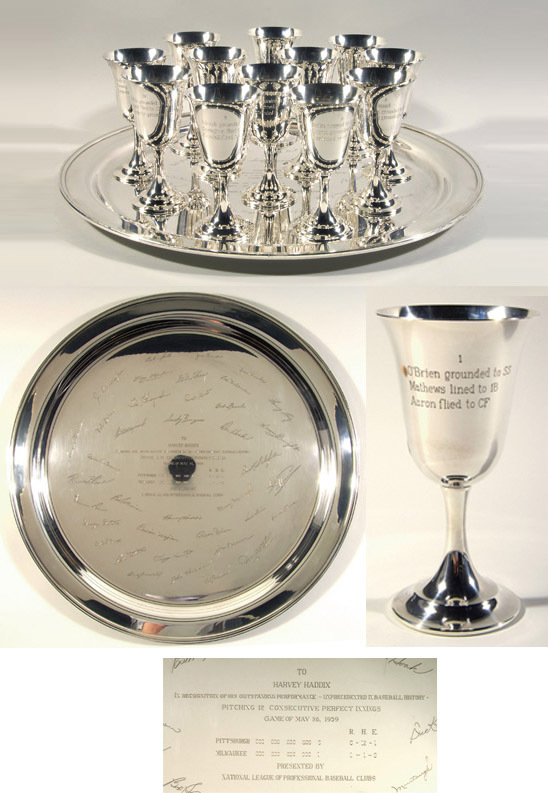 Up for bidding is a set of 12 silver goblets given to Haddix by NL President Warren Giles in commemoration of his amazing game (current bid: $2,285) and his replacement 1960 World Series ring, given to Haddix after his original was stolen in 1983 from a hotel room while coaching with the Pirates (current bid: $2,995). The Haddix family will keep some of the items, but the two pieces above are expected to fetch upwards of $10,000 combined at auction. 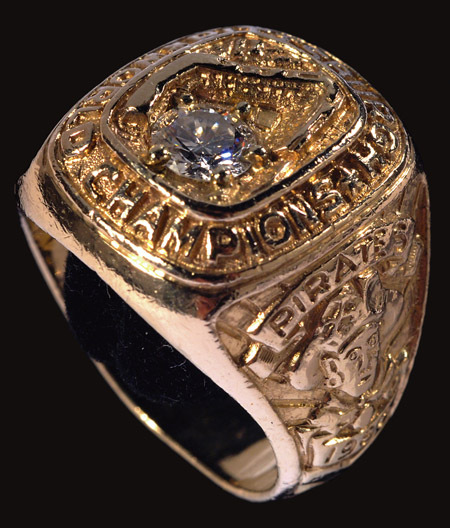 Hunt Auctions of Exton, PA, is handling the sale, which consists of nearly 700 treasures and much more than the Haddix items, and if you've got some extra money burning a hole in your pocket, this is a great chance to remember the good times in Pirate history. The Pirates should buy it and charge fans $1 dollar to touch it every game. Nothing wrong with whoring out past Pirates great accomplishments for profit. Who knows, if things go as predicted, it won't be long at all before seeing a Pirates championship ring will be the equivalent of holding a civil war rifle. I hear they’re planning on digging up Stargell and parading his skull around the field in place of the perogie races next year. That should sell some tickets, right?